So, last weekend Jay went out of town and I had no plans. And I didn’t make any plans. And then, I had lunch with my girlfriends on Friday afternoon that ended with a wee bit of a buzz. Whatever. Then, I got home and only left the house to practice yoga for the next three days. I barely spoke to anyone. This was one of the things I made! Um, no. It’s squash. 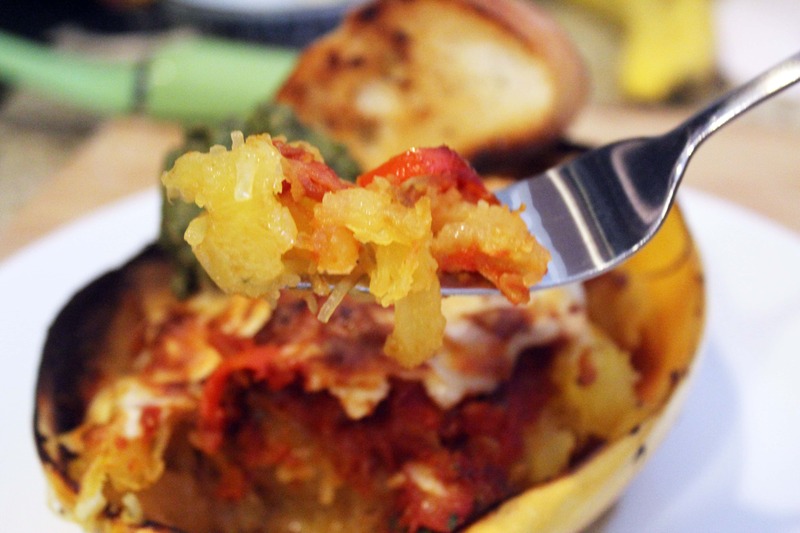 Squash doesn’t taste like pasta! But THIS squash does. Seriously. I was surprised to! So, with a few simple steps, we end up with a lovely low-carb, vegetarian meal PACKED with flavor from all the spices. And with cheese on top. The spices are really what make this dish. It turned out so flavorful! 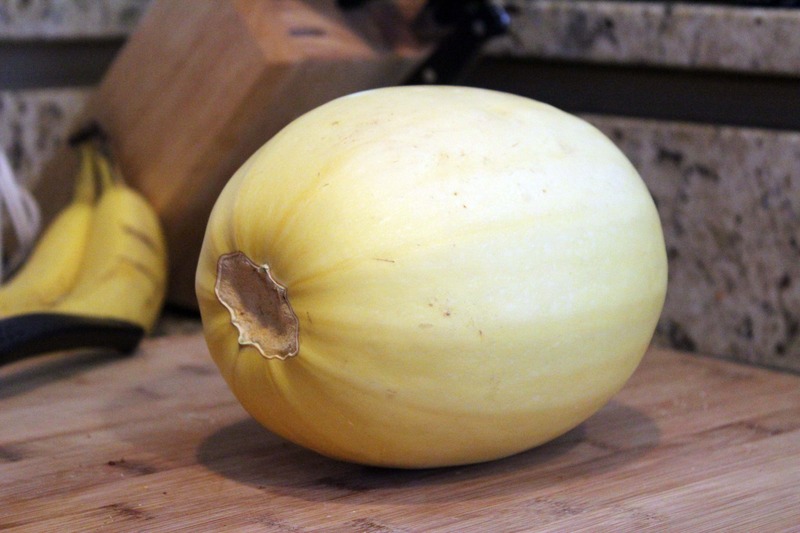 The squash takes about an hour to cook, so we’ll start that first. 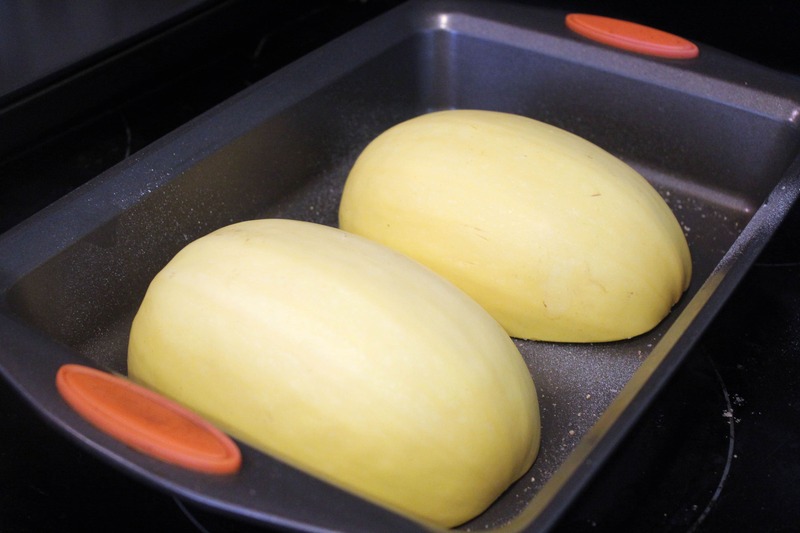 Preheat you oven to 450F, and cut the squash in half. 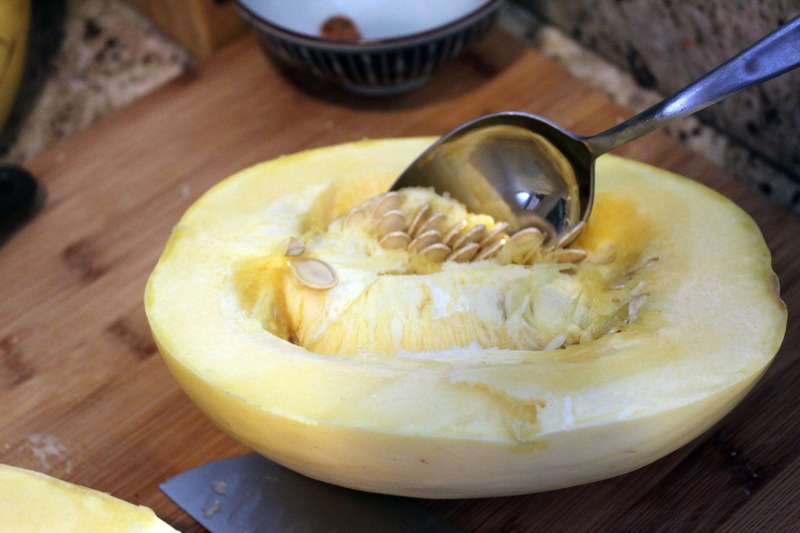 Use a spoon to scoop out the seeds and guts – just like Halloween! 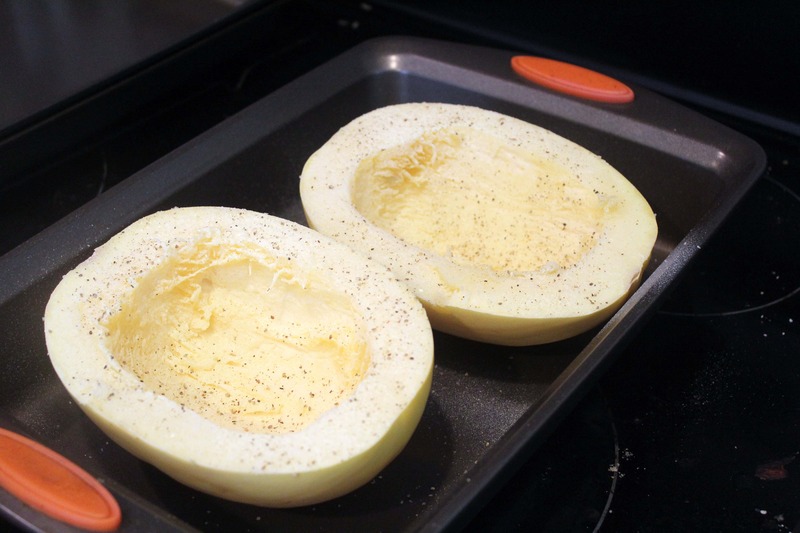 Spray a baking sheet or roasting pan with cooking spray, and liberally salt and pepper the insides of the squash. 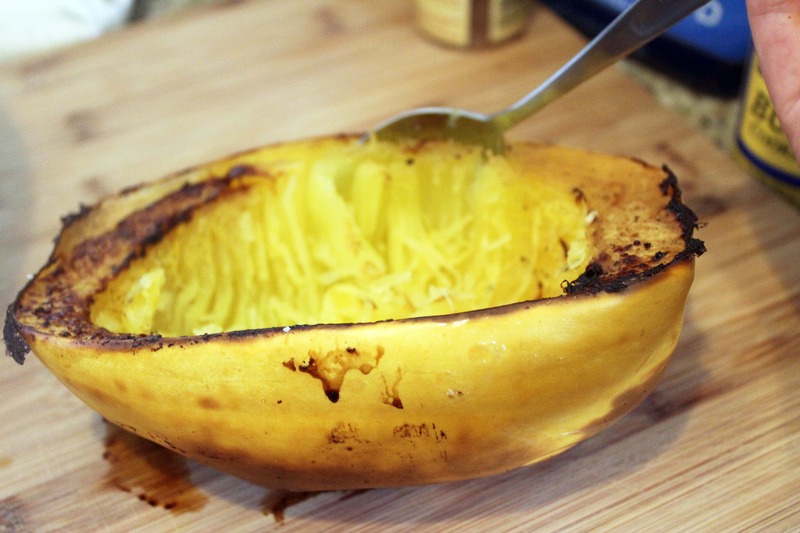 Then flip the squash over and roast it cut side down for 45 – 60 minutes until it’s very tender. 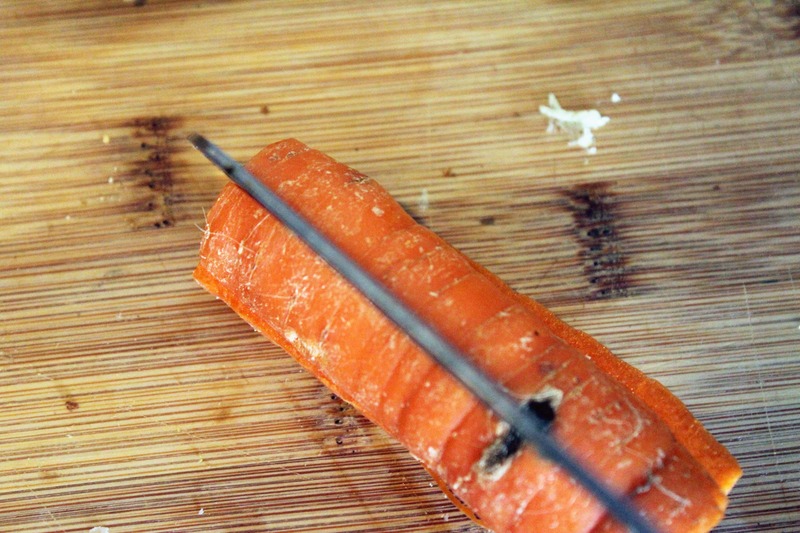 Nice and soft – if a fork slides into the flesh easily you’ll know it’s done. 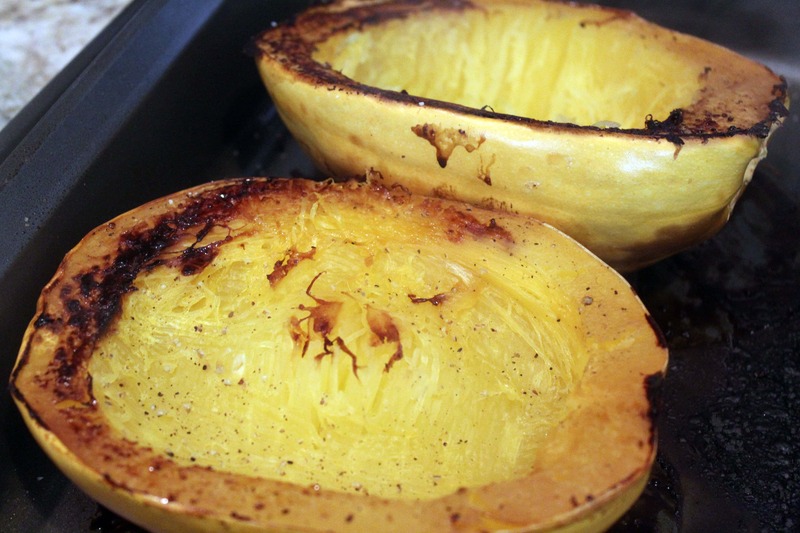 When the squash is cooked, allow it to cool until you can handle it. Then scoop out the flesh with a large spoon into a bowl. 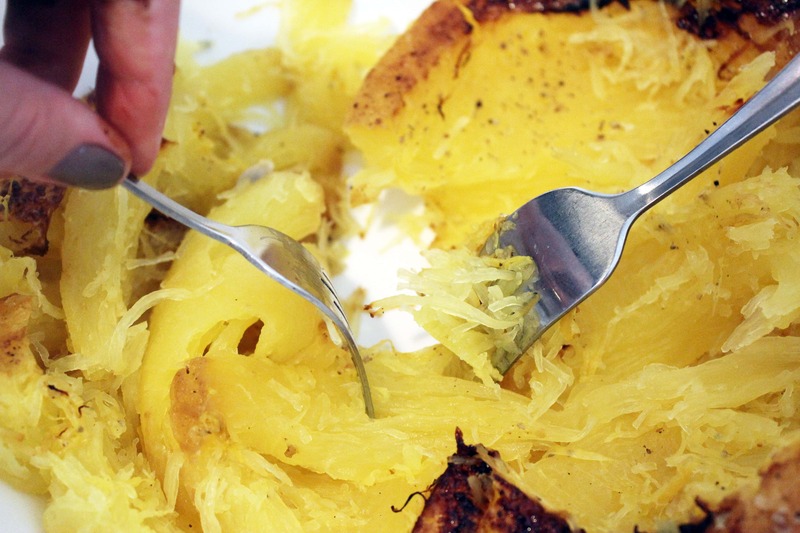 Save the squash peel for later – we’re going to use it as a serving dish! 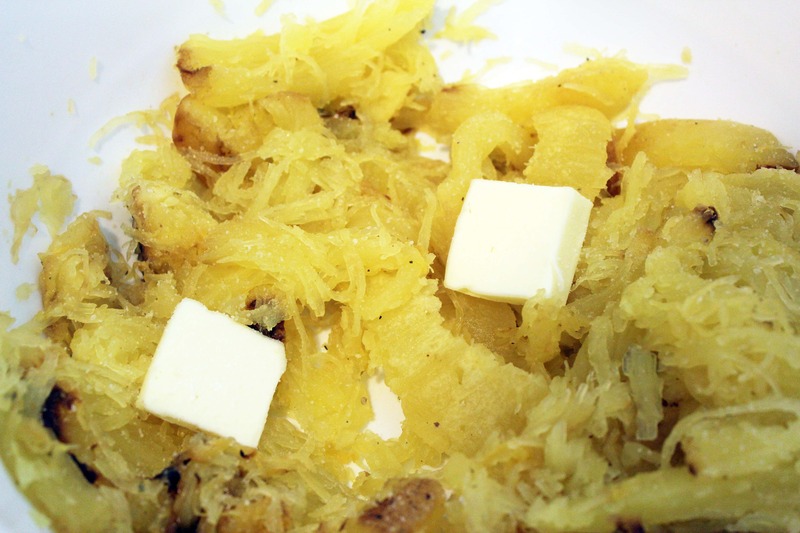 Add the butter to the squash, and shred it into “spaghetti” with two forks. Add more salt and pepper if you’d like! 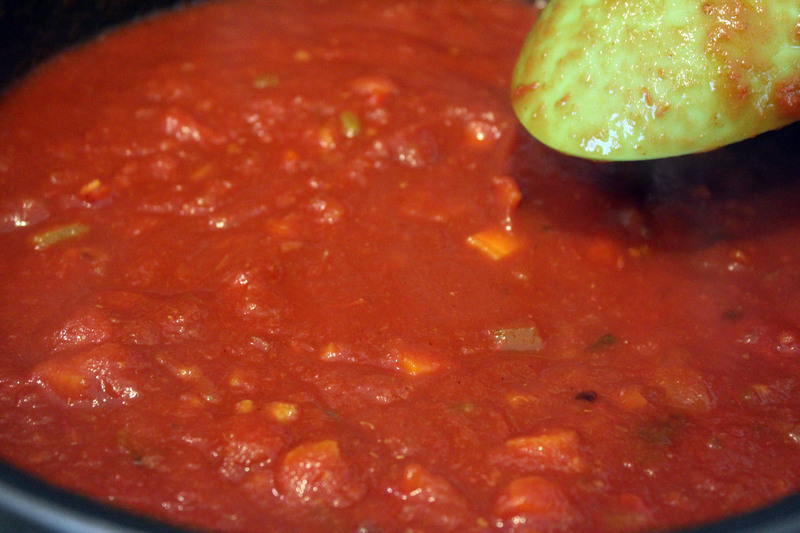 While the squash is cooking, make the marinara. 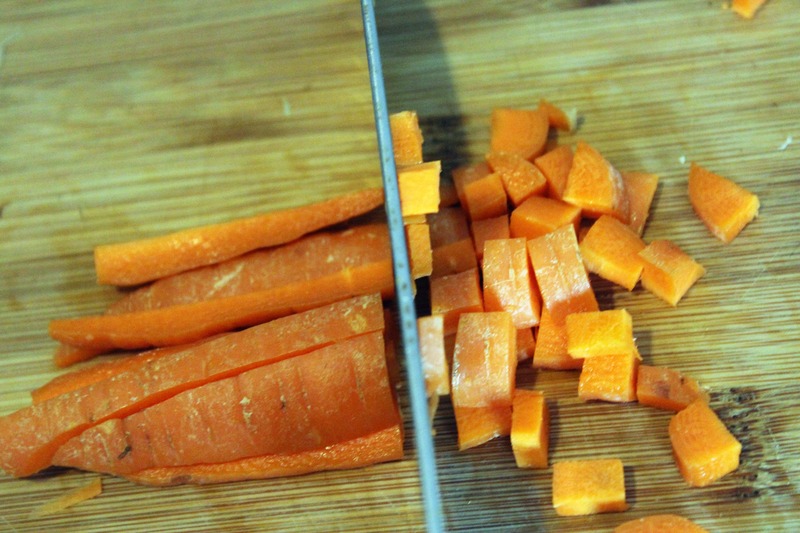 Cut the carrot into long strips, and then cut it into little cubes. 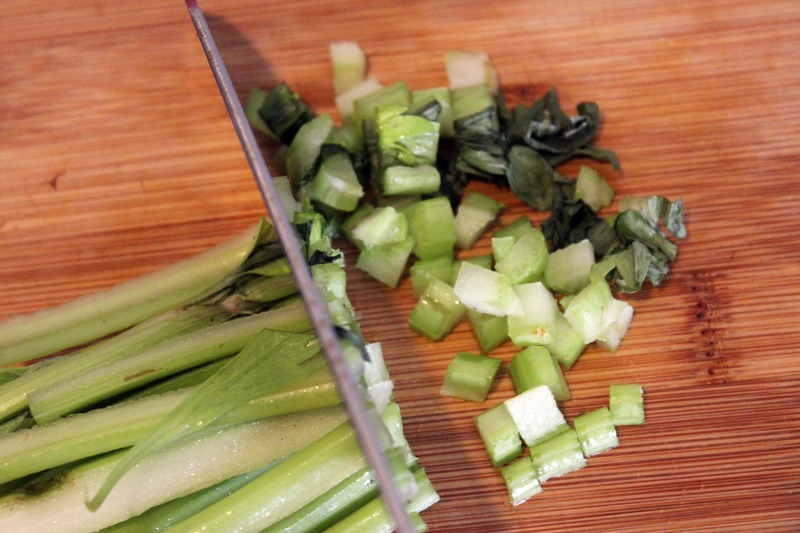 Then do the same with the celery…. 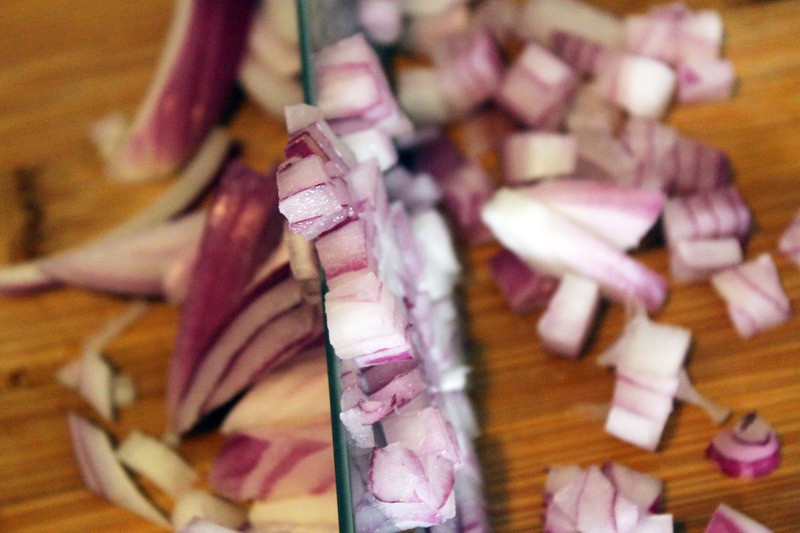 ….and chop the onion. As long as everything is about the same size, you can make it as big or as little as you’d like! 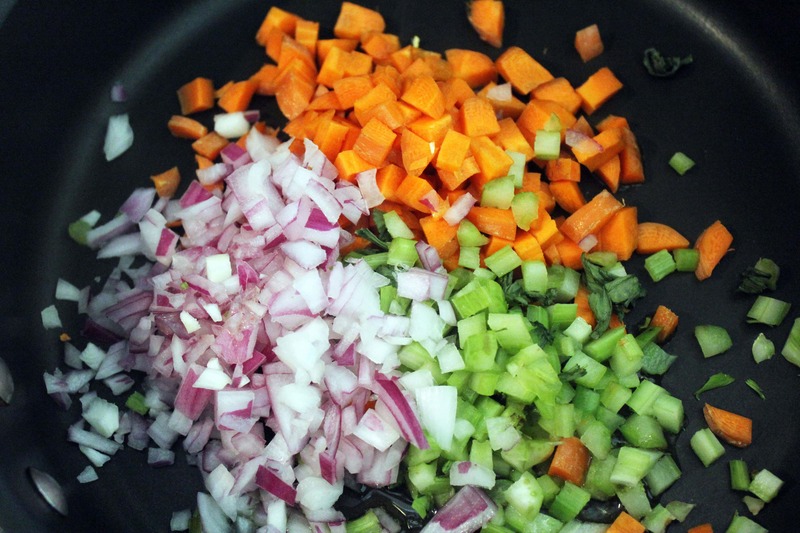 Heat a pan to medium heat and add the celery, onion, and carrot with a drizzle of olive oil and a sprinkle of salt. 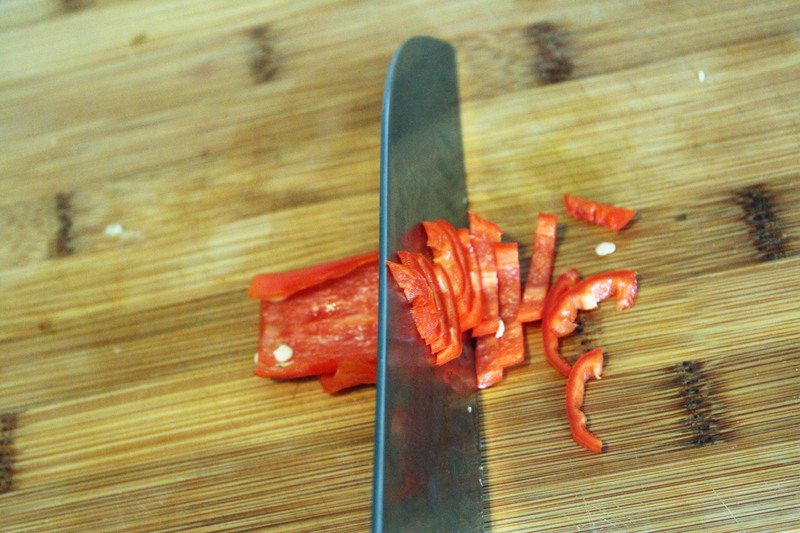 While the first round of veggies is softening, thinly slice the chili pepper. Leave the seeds in if you like things super spicy! 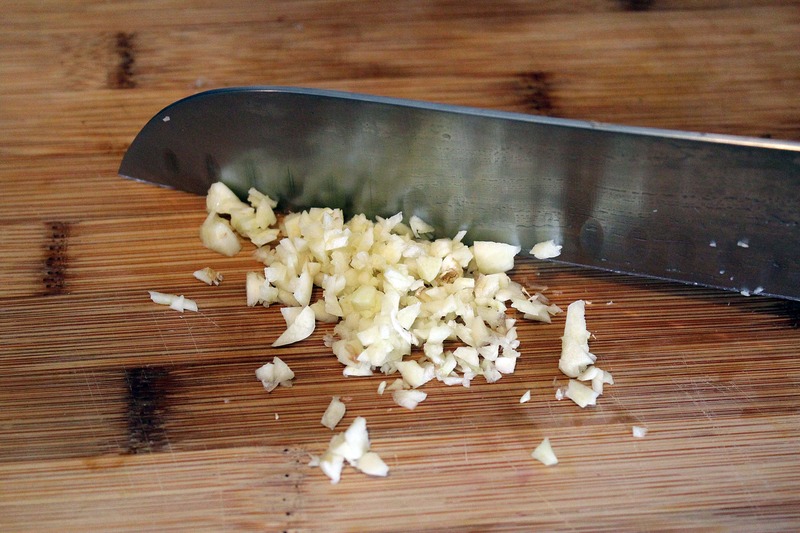 Then, mince the garlic cloves. 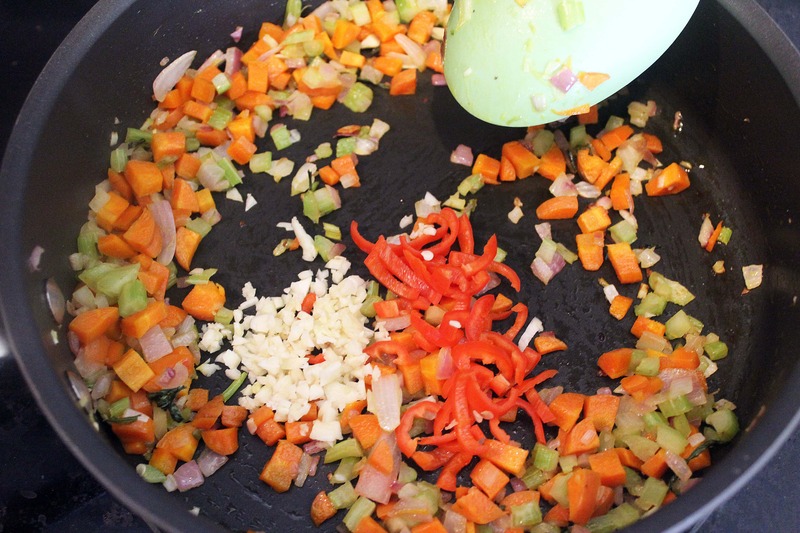 Once the veggies are slightly softened, add the garlic and pepper and stir for one minute. Then, dump in all the spices! The smell here is SO great. 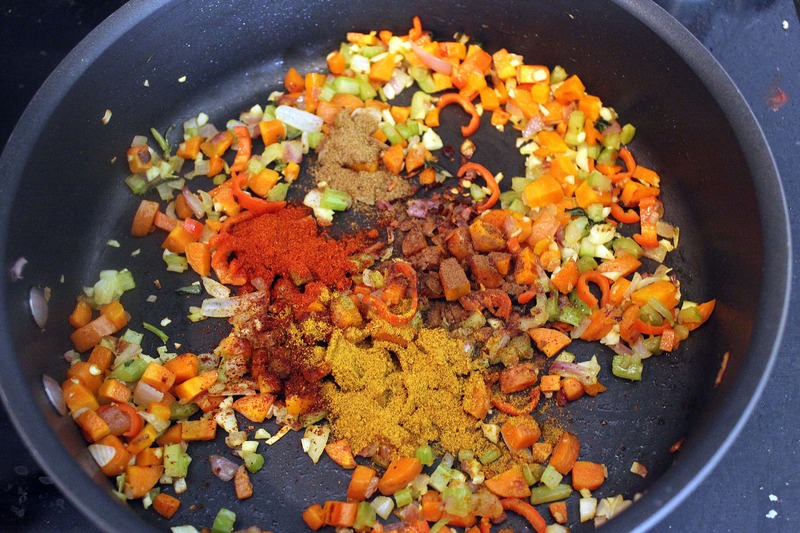 Stir all the spices and veggies together for 2 minutes to combine them really well. Now, dump in the wine! When the wine is bubbly and reduced by about half, add the tomatoes. Stir the sauce to bring everything together, and taste it. Add more salt if you’d like. 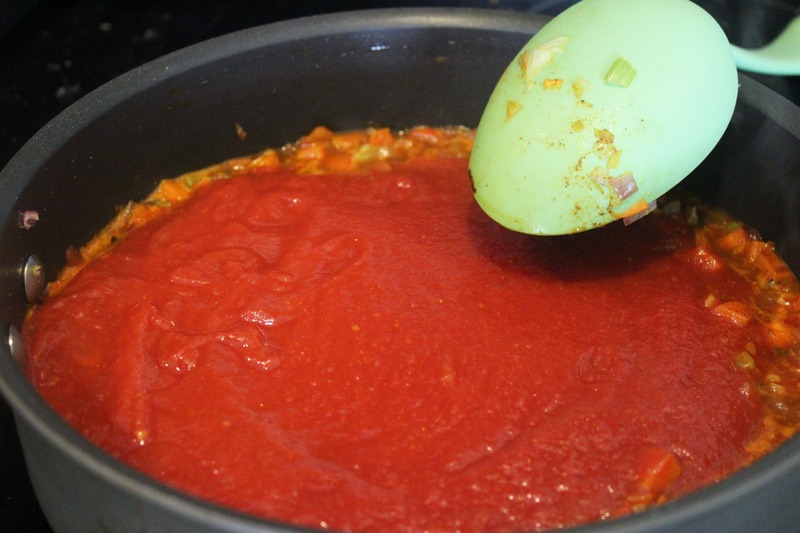 Now, I had some time, so I let the tomato sauce simmer for 1 hour. To do that, I added 1 cup of water so it wouldn’t thicken too much. 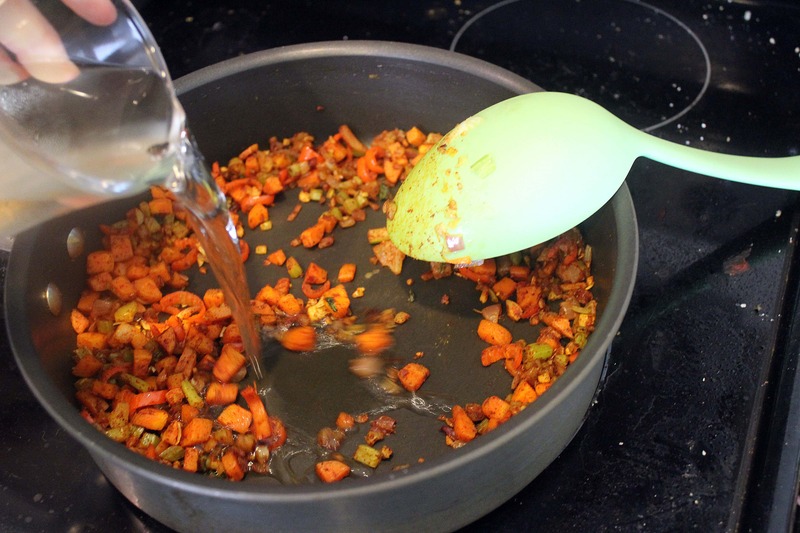 If you only have time for a little bit of simmering, just add 1/4 cup of water at a time as the sauce thickens and bubbles. 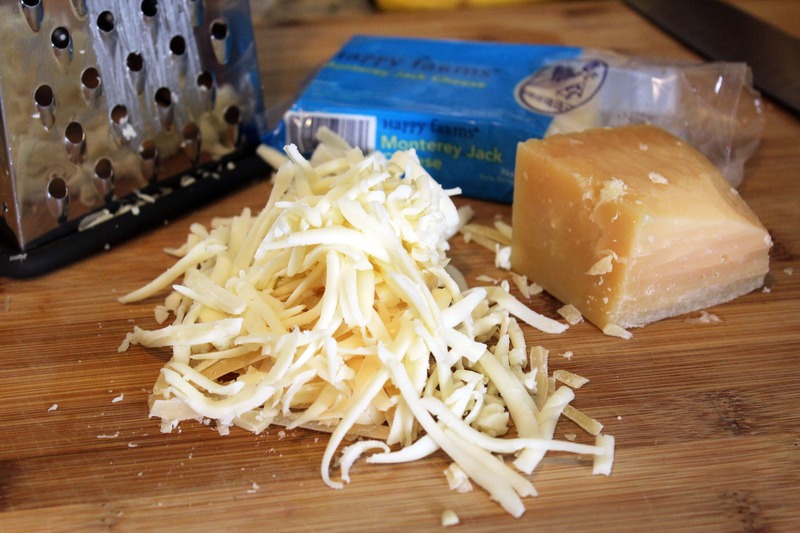 While the sauce is simmering, grate the cheese! 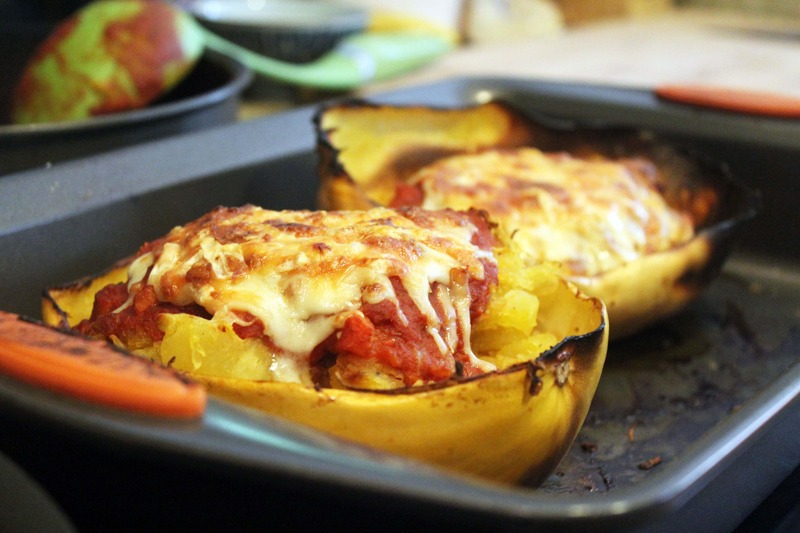 Now, you could do all these steps well in advance and just assemble the squashes when you’re ready to serve – it’s up to you! 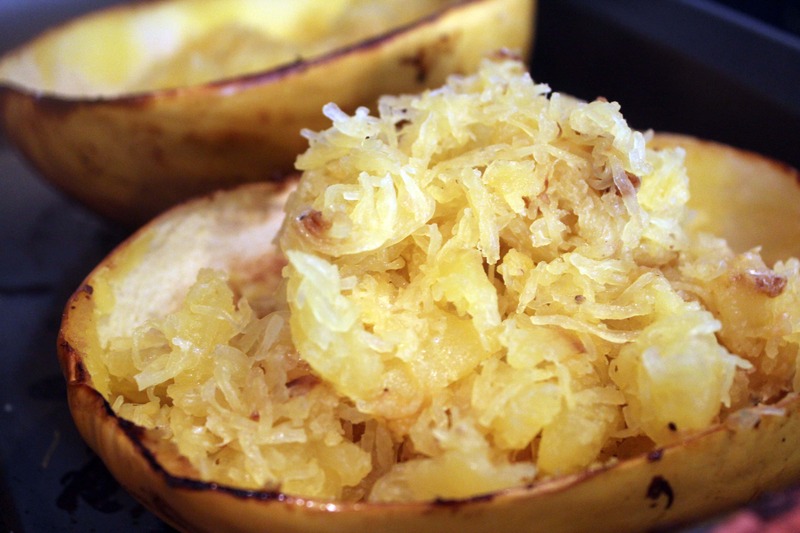 To assemble, place a big pile of squash into the peel that you reserved. 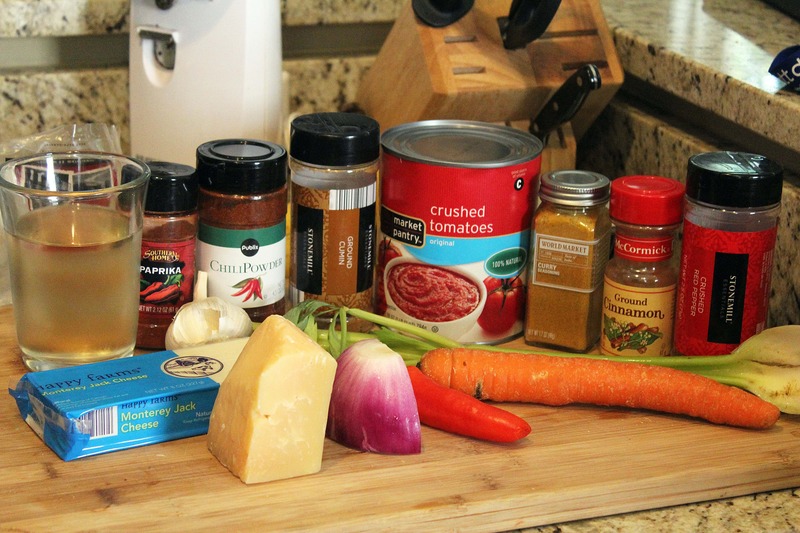 ….and dump on lots of cheese. 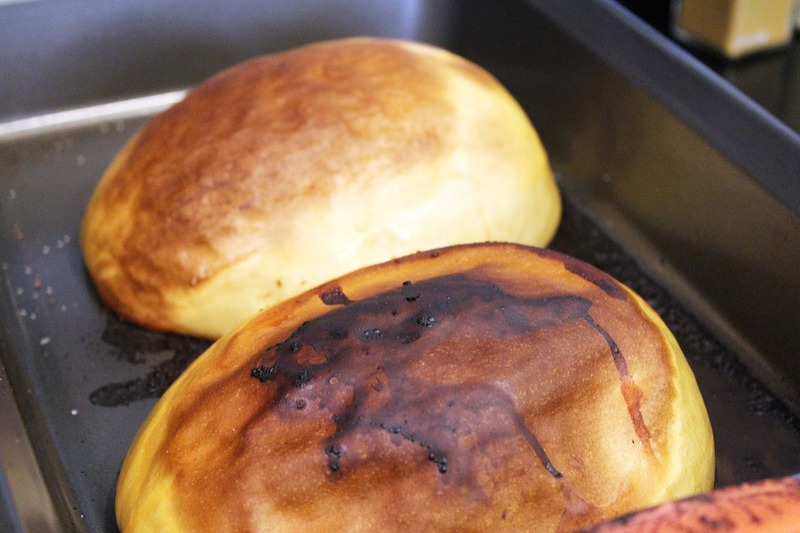 Now, broil them on low for 5 – 10 minutes. 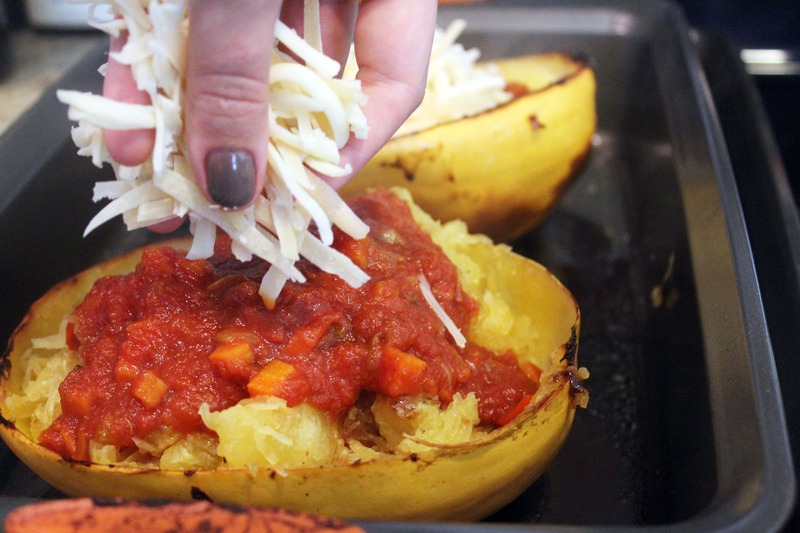 By using the low setting we allow the squash to reheat while the cheese browns. When the cheese browns, we’re ready! This is so stinking good. I can’t wait to make it again! …but what if we added a big scoop of our own pesto and some crusty bread? 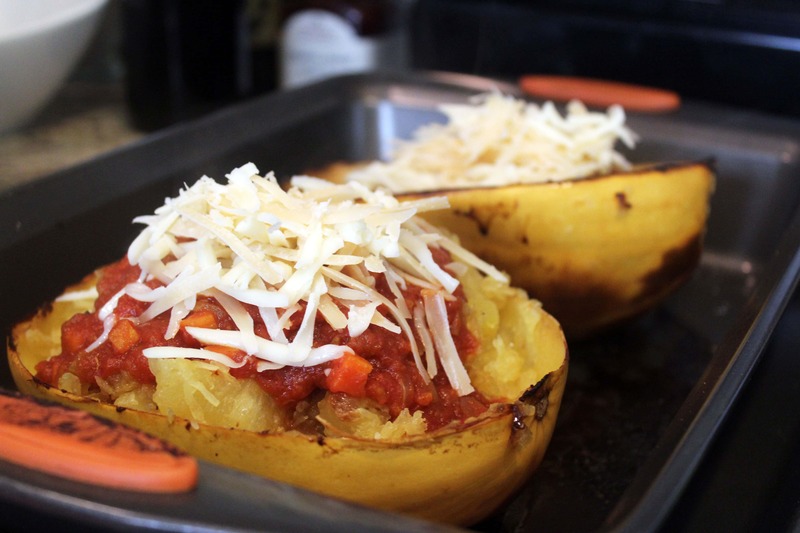 Now, of course you could skip the boat-serving option and put all the squash in a baking dish, top it with sauce and cheese and broil it that way – it will still taste great! This is really stinking cute, though. Maybe a weekend project? I vote yes. Try this one ASAP! this looks fantastic! i think i might try to make this for my jay this week! It was great and really tasted like noodles! 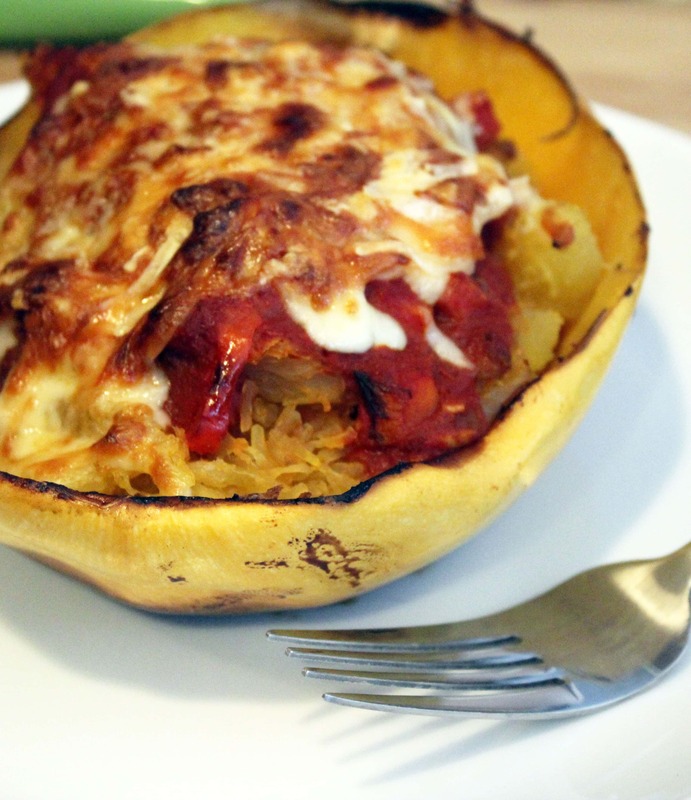 I can’t wait to see what else I can do with spaghetti squash. Yum! 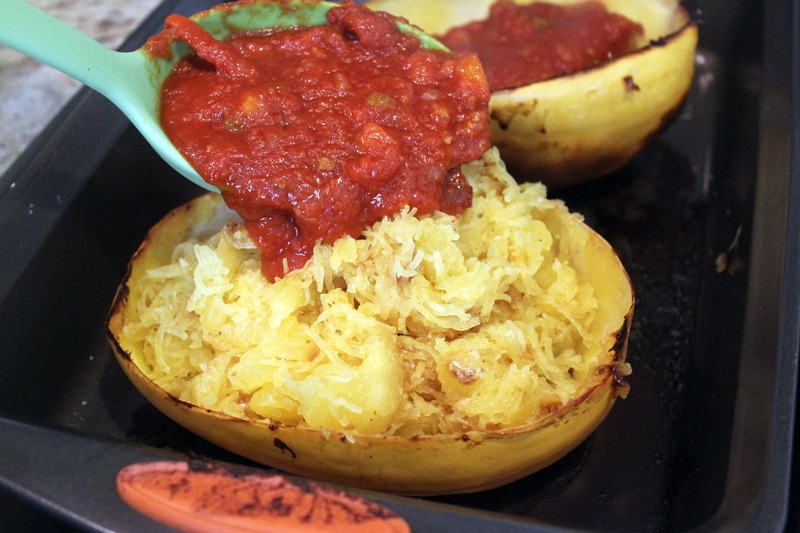 I have yet to try spaghetti squash but have heard how good it is! It surprised me a lot – it was super easy to shred, too, there wasn’t a lot of magic to create the noodle effect. Amazingly good photos. Nice looking result! Thanks! It was a really happy first effort. 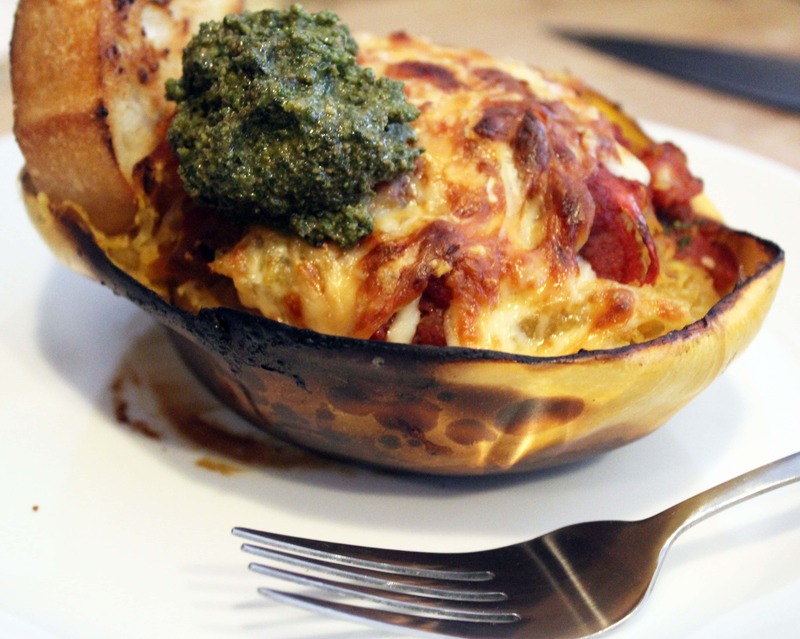 This was so delicious and filling… I couldn’t even finish it! The Hubs loved it also, a total win!